In celebration of the twentieth anniversary of Coach John Wooden’s Tenth NCAA Basketball Championship, we are pleased to announce a very special offering. 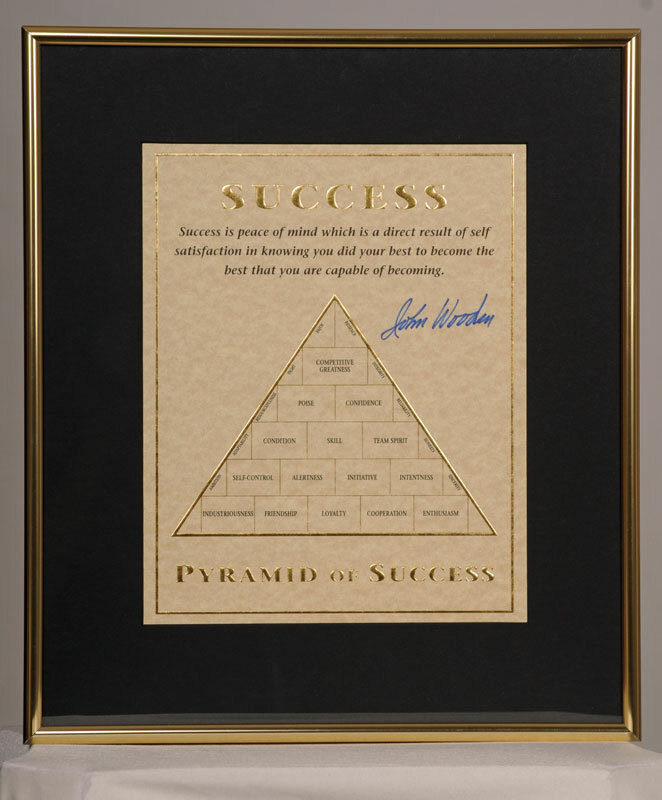 Coach Wooden personally autographed each of these impressive commemorative collector’s limited editions of his famous “Pyramid of Success”. 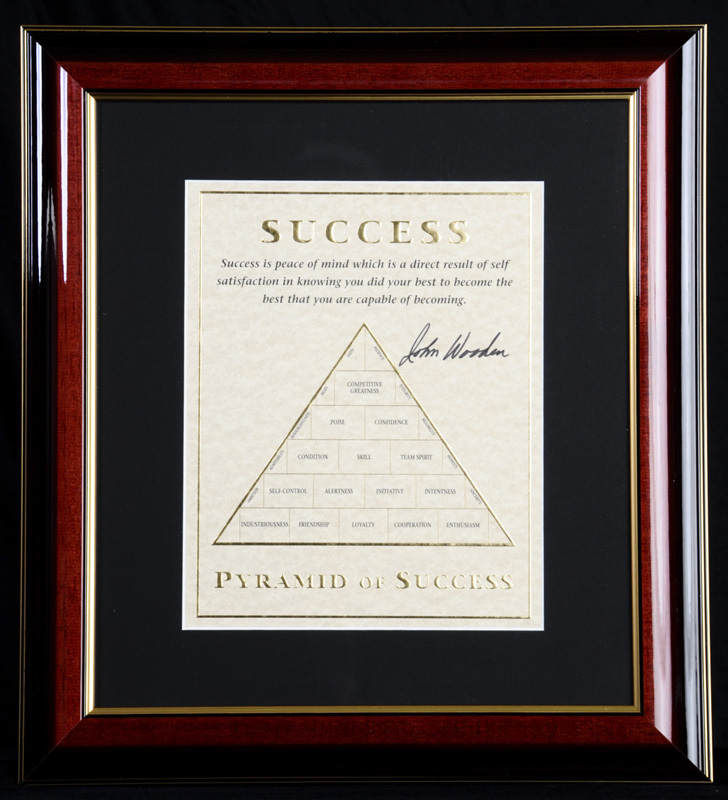 Each impressive print, hand-signed by the coach, is stamped & numbered on the back, and is accompanied by a certificate of authenticity with the matching number. A professionally framed* print is sure to enhance any home, office, business or private collection. 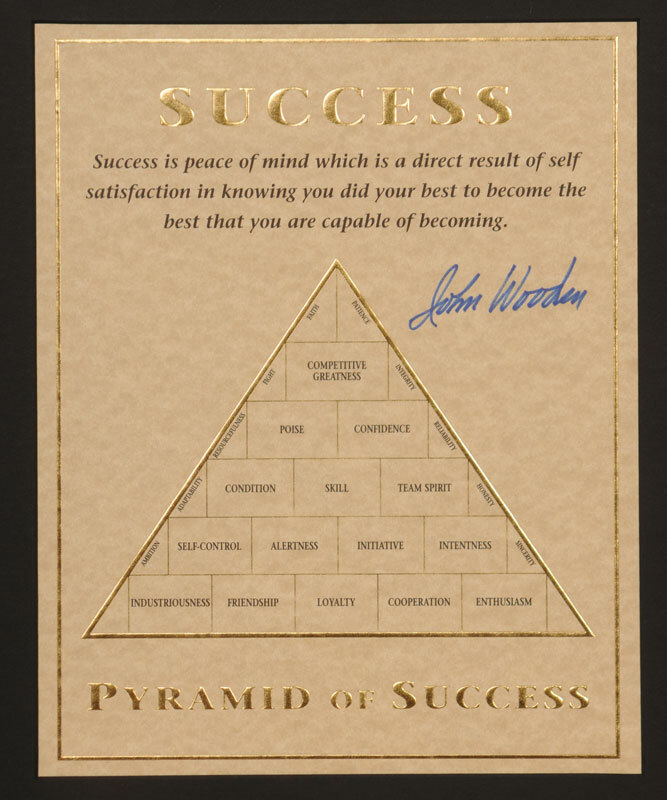 This exquisite piece is printed on the highest-quality 60-pound parchment-finish paper, richly embossed with raised gold-tone printing and crisp black lettering. NEW! 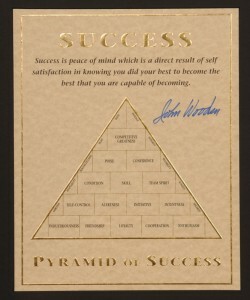 We now offer two suggested framed presentations of Coach Wooden’s Limited Edition print, both of which are shown. 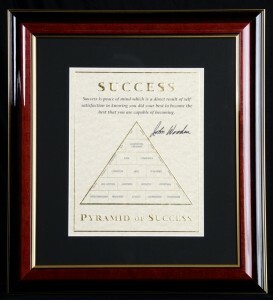 Our newest offering is surrounded by a two inch black matte and our special hardwood frame made for us by Framing Success*. This frame measures 15″x16-1/2 ” and is constructed with Forest Stewardship Council™ (FSC®) certified wood from well managed forests. We also still proudly offer our original framed print, surrounded by a two inch black matte, exhibiting beautifully in our high quality 12″x14″ gold metal frame. Signed and Numbered, Collector’s Limited Edition.Great for Father’s Day, Christmas, Birthdays, Awards, Special Events and Tributes. 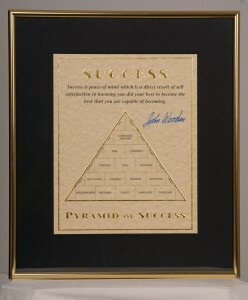 * Professionally framed by FramingSuccess .